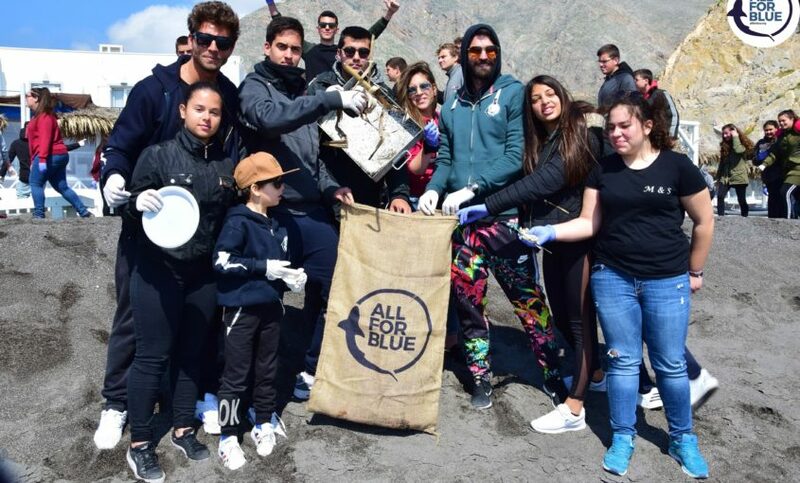 Greek models and TV presenters Dimitris Alexandrou and Giorgos Manikas rocked Santorini, 483 kilos of trash was removed with the valuable help of 400 students from EPAL Thira and several divers! Our day began in the packed room at EPAL Thira where 400 students attended Katerina R. Topouzoglou’s seminar on the protection of the marine ecosystem, a shark awareness seminar. The speaker informed the students about the effects of plastic and how to avoid them (sacks, stainless steel straw, reusable cups), while impressing the students about the shocking truth about the volume of garbage in the sea. Afterwards, after receiving the diploma from the Worldwide Organization, KTELs took the students at the beach of Perissa, where within an hour they collected almost half a ton of trash. Together with students several Chinese tourists wore gloves and helped in the process !! Underwater cleanup once again involved most of the island’s diving centers and Dimitris Kambanos said that in environmental issues we are all united as a punch. The garbage has circulated by the truck of GEOTHIRAS, which brought us the gloves of the action. We thank all those who participated and made the difference, Meltemi Suites for the hospitality and Julia Karamolegou for the cooperation. #KeepAegeanBlue is the largest mission of beach & underwater cleanups and educational programs in Greece and is being implemented in partnership with the South Aegean Region. Our next stations: Milos, Naxos, Syros, Andros, Tinos, Mykonos, Karpathos.